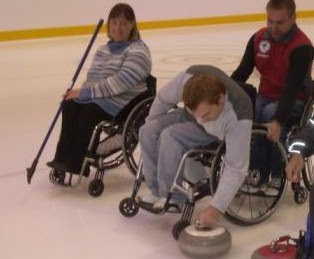 The Victorian Curling Association followed up its successful initial give-it-a-go session last month by attracting ten wheelchair users onto the ice for what will become regular learn to curl sessions leading to wheelchair users joining regular play. The sessions are being held at the Ice House in the Docklands area of Melbourne. James Oastler, who has been a long-time advocate for Aussie curling, reports: We worked on weight control and then played an 8 end game. Next month we'll use the video camera on their delivery with time out to view and discuss their approach. If we can maintain interest we will run the sessions fortnightly. For more information contact James Oastler.